Mini computers exist thanks in no small part to Moore's Law, but one running Linux and Jelly Bean is pretty unique. Developer SolidRun isn't new to the tiny PC scene, but since it released the original CuBox in 2011, it's stayed relatively quiet. That silence breaks with the four CuBox-i models that are up for pre-order right now. 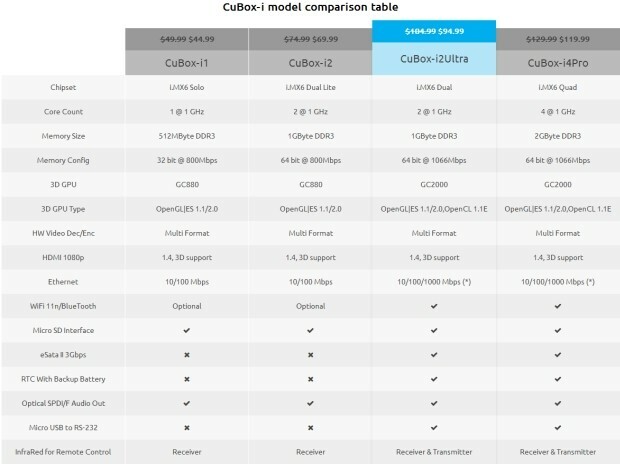 The 2-inch cube computers range in price from the $44.99 CuBox-i1 base model to a fully kitted out $119.99 CuBox-i4Pro. That $120 gets you a quad-core processor with each core running at 1 GHz, 2GB of DDR3 RAM, built-in WiFI and Bluetooth (a spec sheet with all features across all models is after the break). Regardless of price, each model features SATA support, HDMI 1.4 and optical audio ports, which could make a CuBox-i running the latest version of XBMC the perfect workaround to a bulky HTPC.